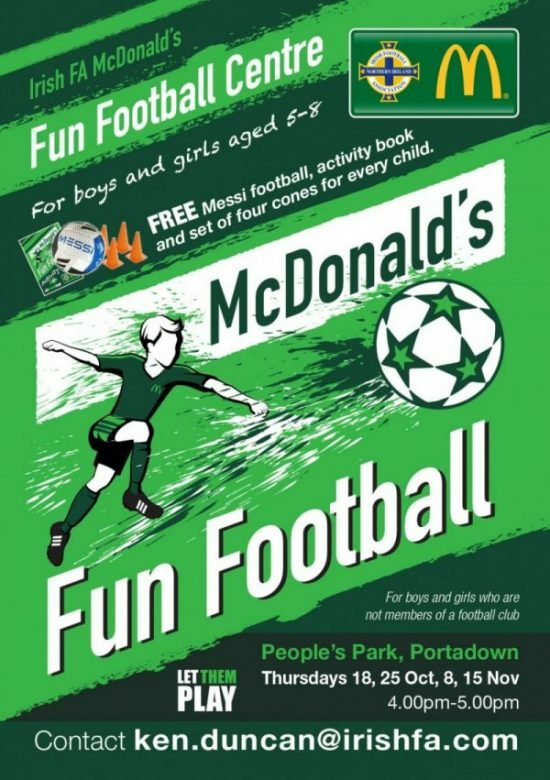 Please see information about a new programme to be held at People’s Park Portadown. We are offering 20 FREE places for boys and girls aged between 5-8 who do not play for any club at present. This four week programme will offer coaching plus free equipment at the conclusion of the four weeks. Please note we can only offer 20 FREE places and registration will be on a first come first serve basis. Kids will also receive a FREE Messi football, activity book and a set of four cones. To request an application/registration form please contact the IFA Regional Grassroots Development Officer Ken Duncan using the email ken.duncan@irishfa.com. Dates are as follows – Thursday 18th, 25th October and 8th, 15th November from 4.00pm to 5.00pm.